Alias Nick Beal is returning! If the title means nothing to you, then you have not read my 2011 post on this unsung masterpiece. You can find it by scrolling down the index column on the right to “Lost and Found: Alias Nick Beal“ — or by clicking on the link you just read. Go ahead, I’ll wait. To be fair, while Alias Nick Beal is a masterpiece, it’s not entirely unsung. The late film historian Leslie Halliwell was a fan, having caught it almost by accident during its half-hearted 1950 release in Great Britain (where it was titled The Contact Man). Otherwise, the movie died unnoticed in 1949 and has been virtually forgotten ever since. Long a staple of Late Late Shows on local TV stations (where I discovered it in the 1960s), it was last shown publicly, to the best of my knowledge, on The Movie Channel in 1990. That will change this coming Wednesday, August 2, 2017. 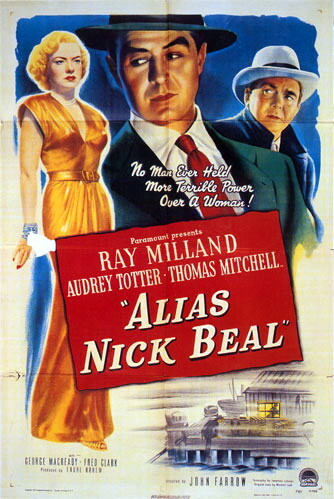 Turner Classic Movies will screen Alias Nick Beal at 9:00 p.m. Pacific Time — that is, at 12:00 Midnight Eastern Time, in the earliest hours of August 3. A most appropriate time slot for this creepy, deeply sinister political melodrama. A word to the wise is sufficient. Don’t miss Alias Nick Beal. After it’s over…well, pleasant dreams.